BlogHome » News » News » 60 Second Briefing: What is Staff Hub? Do you work in a service related industry and keep your employees updated on schedules and information via a noticeboard in the staff room? If so, there could be an easier solution for you. Here we have Staff Hub. 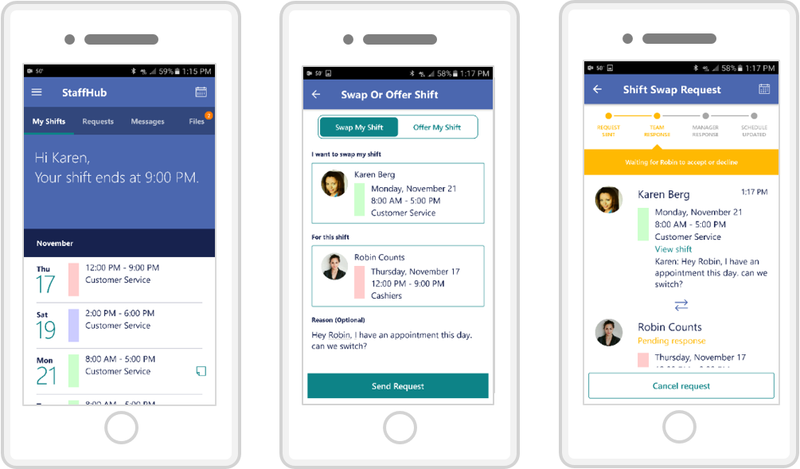 With Staff Hub, your employees can access schedules, swap shifts, request time off and find information all through one app. Anywhere. This app is aimed at those people who work in the service industry and don’t tend to work on a computer – especially those whose schedules change on a weekly basis. Staff Hub is really challenging the old ways of staff and work management such as paper rotas, notices boards and other manual processes. Freedom to work and get on with life. As a manager, you can create schedules, approve requests, share information, and control communications while your employees receive alerts and notifications without having to physically go into work and brief themselves. This app is available for Office 365 K1, E1, E3 and E5 packages and can be accessed online or through the mobile app. previous post: 60 Second Briefing: Groups vs Teams?